Web page for the historic site. As the U.S. drew closer to war in 1941, a few military officers, notably Lt. Col. John Weckerling and Capt. Kai Rasmussen, realized that there would be a need for Japanese translators in the Pacific. They began to push for the creation of a language school to intensively train people to be military linguists. 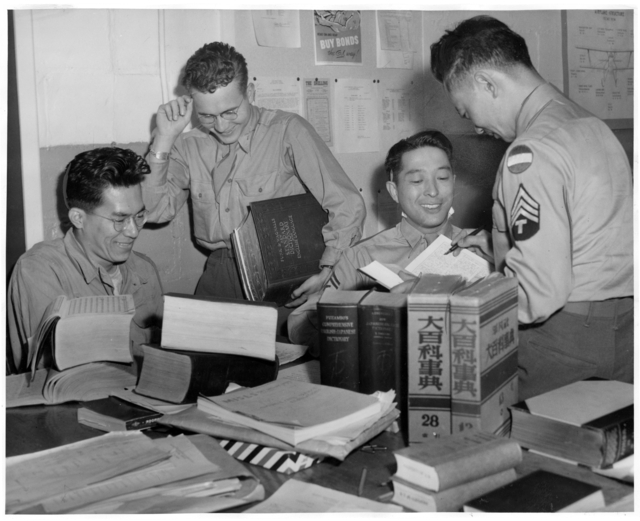 This naturally led them to the idea of recruiting Nisei, those of Japanese ancestry but born in the U.S., who might have some experience with the language already; however, many military officers did not believe that the Nisei should be trusted. Despite that pressure, Weckerling and Rasmussen put their jobs on the line and got the Fourth Army Intelligence School opened in San Francisco on November 1, 1941. A few months later President Franklin D. Roosevelt issued Executive Order 9066 that led to the internment or relocation of Japanese families. Because the school was housing Nisei, it had to move or lose nearly all of its students. After a number of other midwestern states declined, Governor Harold Stassen of Minnesota agreed to take in the school, so it moved to Camp Savage and changed its name to the Military Intelligence Service Language School (MISLS). Within a couple of years, the school outgrew itself and moved again, this time to Fort Snelling in St. Paul. Eventually MISLS graduated more than 6,000 linguists. Its graduates broke codes, served on the front lines, and even became instructors themselves. Their service in the Pacific theater of World War II was so successful that it prompted Major General Charles Willoughby to say, "The Nisei shortened the Pacific War by two years and saved possibly a million American lives and saved probably billions of dollars."